If you read my February 2015 Ipsy Glambag Review, then you would have seen that I was sent GlamGlow BrightMud Eye Treatment. I hadn't given it a try when I wrote the review, but now I finally have. The package is unique. 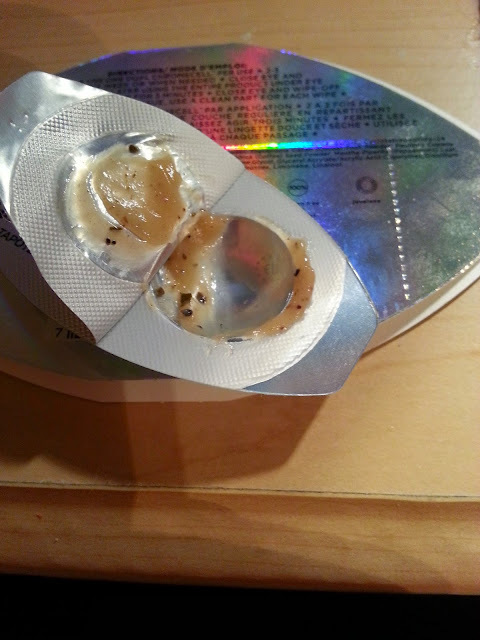 It's an oval that opens up, with a little packet with two pods inside. The instructions state that you are supposed to use one pod per eye, tap-on an even layer using the entire product under eye or orbital eye, leave on for 3 minutes, then close your eye and wipe off slowly with a soft dry tissue, using a clean part of the cloth for each wipe. I found that one pod had more than enough product to do BOTH of my eyes. Actually, I probably could have stretched it even further by using half of the amount of the pod under both of my eyes. I don't think you actually need to use as much as recommended. It seems like a waste, and a good way for them to sell more. What freaked me out the most, was that there were tea leaves in this formula. Isn't that a little dangerous? To be applying LEAVES under your eyes? 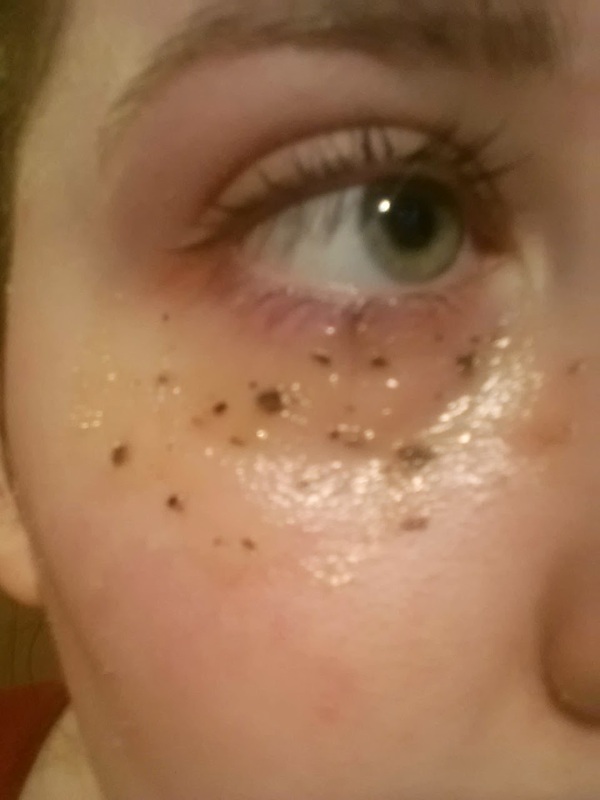 What happens if one gets into your eye? I don't know.. I didn't feel very comfortable doing this - but for the sake of review purposes, I did it. A lot of people are complaining that it burned them when they used it. I would say that it does tingle a little, but it wasn't uncomfortable or painful. It also smells like tea leaves. Once my 3 minutes were up, I wiped it away. Personally, I didn't find any difference afterwards. I don't really have puffy under eyes, so that may be why. I do have dark circles but I didn't see any change. I will probably get another 1 or 2 uses out of the rest of this package. I was only sent one, instead of two, in my glambag, and they actually sent me a replacement for it. 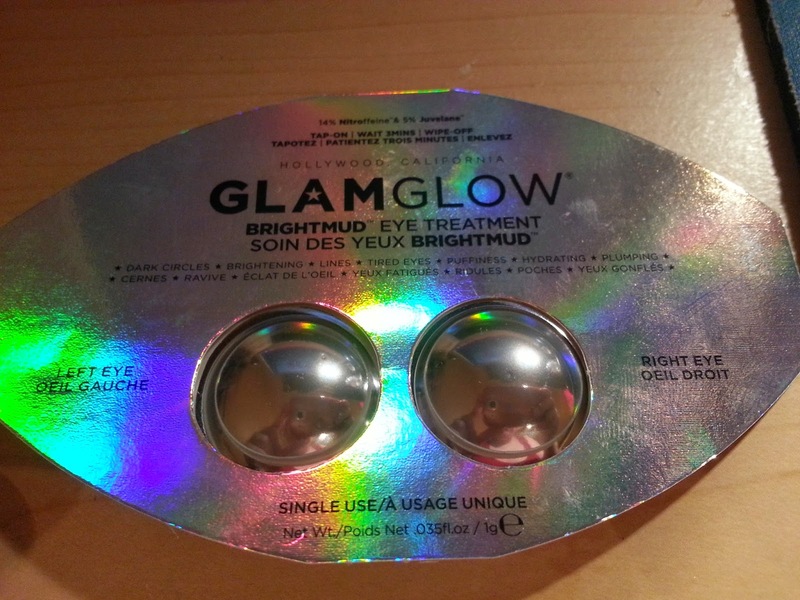 Except it was the GlamGlow Tinglexfoliant Mask - which I received before, and loved. So, I'm not angry lol. Would I purchase this full size? No. It's definitely not worth the $76 (Canadian dollar) price tag - especially for only "12 treatments." It's available on Sephora - and there aren't many positive reviews for it there either. *Edit - just after writing this review, I checked my mail box and found another pink bubble mailer. Confused, I wondered... why is there another Ipsy envelope here? Inside was... ANOTHER GlamGlow Tinglexfoliant Mask... thanks!